There is no exact science to selecting the optimum size of your surfboard although an internet search will give you some rough guides. Bigger boards offer more stability and faster paddle speed which makes it easier to catch small waves and keep your momentum. 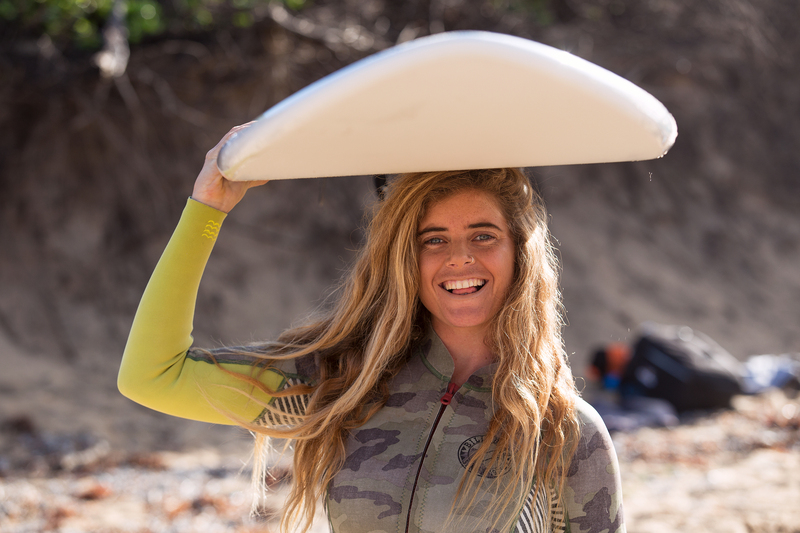 Smaller boards turn sharply and are great for performing progressive turns although the smaller surface area reduces the paddle speed and means that you will lose speed quickly when gliding through flat sections of a wave. If you are a smaller or a young surfer then you may have problems holding on to a 9 feet longboard when the waves hit you on the paddle out. You may consider choosing a smaller longboard or a small fun board. Shortboards are more advanced and are generally used when the waves are more powerful or steep. The thinner shape helps the board roll from edge to edge quickly. Although it is possible to ride a small shortboard, most people would choose a board that is no smaller than their nose level. Fish boards on the other had are wider and shorter by nature. By taking away surface area in length, it is made up in width. This width helps the board to glide well in small or weak waves and stops the tail sinking when performing skate style kick turns. The small length reduces the amount of board swing allowing the surfer to change direction quickly. Performance of a wide board is sacrificed when a wave gets steep as they tend to skip out and lose the line. What do the different shapes offer? With thousands of shapers around the world, no two boards will be exactly alike, however, there is an industry standard to shape and below we list the most popular. You will, of course, come across custom shapes and these again vary from shaper to shaper. 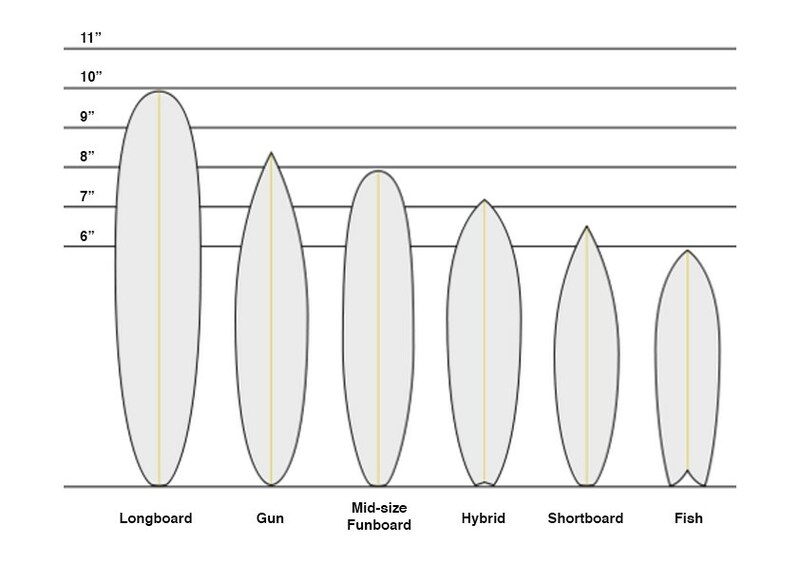 We hope the guidelines provided helps you to choose the best shape for your size, skill level and wave conditions. Have fun and let’s go surfing! Longboard – The most traditional surfboard shape. They typically range from 8 feet to 12 feet in length and at least 2.5 inches thick & 20″ wide. These boards are great for learning to surf – for leaning wave selection, paddling technique, and turning basics. Longboards offers stylish, fancy footwork. This board style is for everyone. Funboards –Smaller versions of the classic longboard shape, the fun or mid-length board range from 6 feet to 8 feet. The Funboard is a transitional board for those who progress down in size while keeping paddling power and stability. Great for beginners due to the wide shape and good stability. Funboard’s sport various tail shapes, nose shapes, and foils. Ride in anything from ankle biters to chest high conditions. Shortboards – Designed for high-performance surfing and allows surfers to push the boundaries of their ability. Under 7′ feet long, the surfer can get aggressive on the wave. Features include a sharp nose, thin rails, and high rocker in order to produce high levels of manoeuvrability. This shape is ideal for intermediate to advanced surfers. Hybrid – The hybrid mixes the design features from two similar board types. With characteristics and performance of a shortboard design added width and tail of a fish. Performance rails, bottom rocker and foil to make it fast, stable and manoeuvrable. Great transition board for someone who wants to move faster. Surf this board in anything from knee to head high conditions. Fish –Short, stumpy board for riding small waves. Shorter, wider and flatter than a shortboard and works very well in small mushy surf. A minimal curve in the rocker allows the rider to paddle easily and carry speed through flat sections of the wave. This shape is ideal for intermediate surfers looking to maximize turns and speed on small to medium sized waves. Gun – Big wave days – take the Gun. Thin, needle-nosed shape, similar to a shortboard but much larger. Ranging from 6’6” to 10’ for fast paddling to catch fast, heavy waves. Gun shapes are difficult to ride and require a lot of experience. Unfortunately, we do not accept any returns. Due to the large size of these products, postage costs are high and we will not accept or refund any orders that are returned to our warehouse. If your board has been damaged in transit or is different from what you have ordered then please contact info@uk.nspsurfboards.com explaining your issue and we will work to get it resolved in a timely manner.